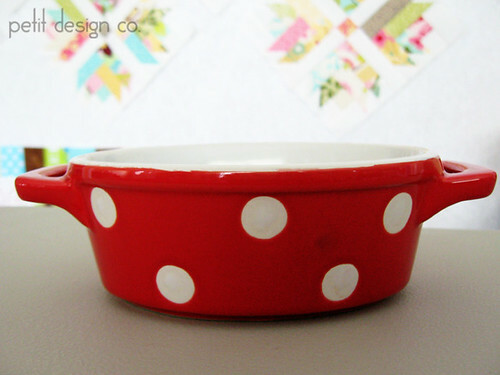 …and cute polka dotted red bakers that I bought for no reason whatsoever other than the fact that they make me happy! to do a Google search for them because they are hard to find. Sometimes Amazon has them. These blocks are nice and big which lets you end up with a nice big 48”x48” baby or wall quilt. The blocks are nice and big for showcasing your favorite fabrics. You can also make a super graphic quilt using solids. It would also look fabulous with just 2 colors or prints. I need to finish putting my rows together but you get the idea. I hope to have the pattern ready in the next week or two. Come back on Friday and I’ll show you how to piece those curves together. It’s really not that hard! Love your Seussy start to your post, the red polka dot cup and those really cute blocks--love them! Love what you did with your dotty blocks. 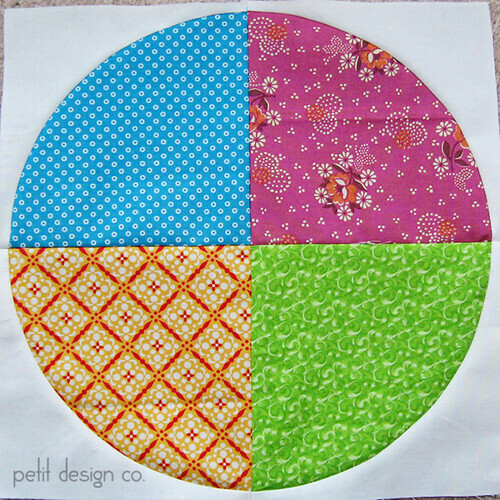 Haven't tried curve except paper piecing. Name, well maybe All Roads lead To Dots! Thank you for sharing and the giveaway. Oooh its lovely - I would call it "Going Round In Circles" thanks for sharing. The blocks look like "happy flowers" to me! Thanks for the chance to win the pattern, I love it! hope to see you around my blog tomorrow for the last hop! I like your version of drunkards path. I'd call it Forever Bright Paths. I do like to sew curves and sew would love to use your pattern. Thanks! I love your block! As for a name? 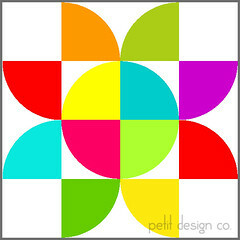 hhmm Modern Flower Dot? Thanks for sharing. I'm a curve novice but I'm determined to master them! Actually it's the cutting I'm dreading more than the piecing! I love your dotty dish! Love the pictures of your dotty stash and your dotty block is lovely - looks like a Star Flower to me. I've pieced a few curves but tend to avoid them if I'm honest. I love your bright blocks, the make me smile. Why not call them Happy flower,as the look to me as big flowers. I have no special tips to sew curving seams I just go on it. Thanks for sharing your blocks. Great block and wonderful quilt. It is so bright and cheery...hey, how about that for a name? Bright and Cheery? Awesome block!! I have put it in my inspiration files! My, I do envy your great collection of dotty fabrics. Your quilt with its curved piecing is gorgeous - such a simple idea, but assembled so imaginatively. Great work! Love all your dotty things, but those quilt blocks are soooooo cute. Now I need to make some. cute pattern. I dub it Quarter Dots. 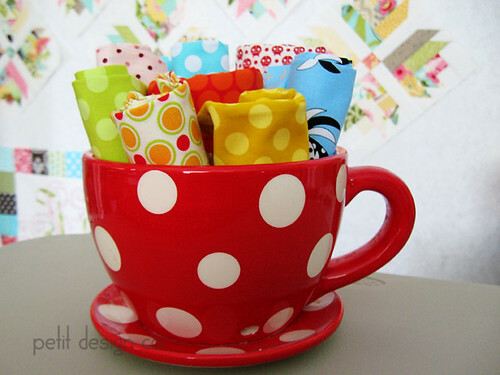 I love all those dots...the fabrics are so pretty and the cup is cute too. I like your block and quilt as well. I have one of those feet that sews curved seams, but I only used it once. I really should use it more often, but then I need to sew more curved seams, ha, ha. Lovely pattern, great job. I have made 2 dbl wedding ring quilts,one lap size, no problem at all and a king size. No problem with the small curves but the long seams were a bear. This is a very cute pattern - great to use with dots. Oh, curves don't scare me - they really are easy. Now Hexies, they scare me! 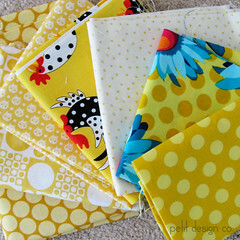 Your block is fantastic, I love the fabrics you used for your baby/wall quilt, very nice! I have sewn curves, they weren't as 'scary' as I thought they would be to do. I love dots! 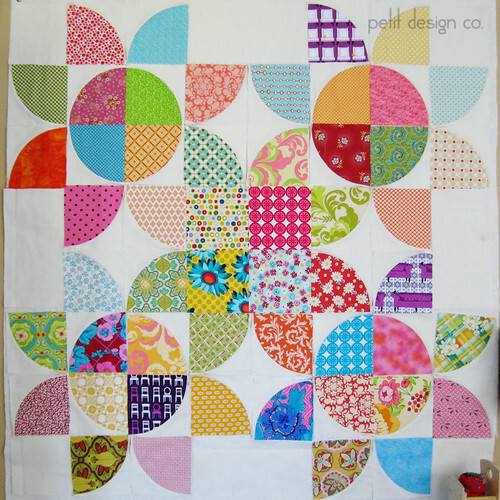 your quilt is great!I have been wanting to try curves..
What a clever use of the circles! I find curved seams intimidating but, but they usually work out if I pin them enough. I've never tried piecing curves. This pattern looks great! I'd call it pocket full of posies. Love all of the wonderful colors!! Radiant Curves. I don't know about sewing those curves. I bought a special foot to help me do it, but I havn't tried it yet. I have a pattern that I am going to try it on.. just havn't gotten that far yet..I'm shakin in my boots!! Tipsy posies? Thanks for sharing! Your block is fabulous! Just great! Hi!!! Your big dot looks like fun!!! I am a new quilter and not quite ready for circles!!! But on a name maybe One Dot at a Time!!! I'm surprised each time I try it that piecing curves is really not that difficult. The trick is taking your time. Your project looks great so far and I think it will be wonderful as a baby quilt. I love your quilt and all your dotty fabrics. Curves scare me and so I have not tried them. I would call your quilt Polka dot Posies. That's beautiful! I would call it something like "Dotty Daisies". I love it! Love your project. What a great quilt. I love to sew curves. It is not difficult with my Pffaf. It is just a matter of control the start and the end. I would love to buy some of that chicken fabric do you know the maker by any chance? I am bad with names but "Flower Power" keeps popping in my brain. LOL. So sweet , love how this pattern emerges when other blocks are added , I think I would call it Connecting flowers , not all that exciting I know :-) Thanks for sharing your very pretty blocks! I am a new quilter and haven't tried curves yet -- but I just cut pieces for a fish quilt, and it will have curves that need to be conquered! Loved the final look...awesome! Thanks for sharing. Just love the uses of the drunkard's path block...I've seen a couple ideas on this hop. Great ideas for the templates I recently bought for another class but haven't used yet...I'm a little behind. I really love how cheerful your quilt is. Thanks for sharing. I love the Windblown Flowers look of your blocks. All the polka dots you have shown us, I like the big cup and saucer. I *love* your quilt pattern! It's really fun and beautiful. Thanks for a chance to win a copy of it! I love your dotty quilt. It makes me think of flowers in the sunshine. Thanks for sharing. Love your quilt pattern - really love the flower that happens. Curved piecing - gitting better with practice. It seems you and I had the same idea about Dr.Seus...I took a differnt approach....I will go and put a little tag on my post now back to you so people don't think I copied. Great post! That's a wonderful design. Really turned out nice. I don't piece curves without a little glue first, they come out perfect if I do. I have to go look at the kawaii cupcake post! 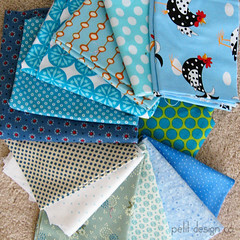 I love your blocks and the fabrics you used are really gorgeous! It makes a stunning quilt. I have seen this pattern made several ways on this blog hop and I love all the ideas. Can't wait to try some of them. I haven't tried to sew curves yet but I am eager to learn. I will be back to watch you.Thanks for sharing. Love all your dots. Curves can be scary but really they are not so difficult to sew. Just pin each end of the piece and ease the sewing taking care, not to stretch the edges. I let a project sit for two years but once I jumped in..I couldn't believe how easy it was. Now this is a fun, novel pattern! How about Merry-Go-Round? Don't you just love dots all around the house? I do love your Dotty Cup!! Blocks and quilt are Oh so colorful and nicely made!! I have some of that fabric! Dunkards Flowers. I love the idea thanks for sharing. Great design. I was terrified to try the curves until I actually did it. It wasn't as bad as I thought it was going to be. How about "Spinning Petals"? I really like what you've done and I must admit, the temptation to try curves is getting the better of me. Maybe I'll be lucky and win your pattern! Fingers crossed! I enjoyed reading your blog, you do beautiful work. Your quilt is fantastic. I think I would name it: "Dotted Flowers of Love"
Thank you so much for sharing your creative world today. You are very inspiring! dotty daisys. Looks like a fun stash buster and a great baby quilt. Thanks for the giveaway. This is nice! Like a big slice of pie! I think that would make a nice name! ..slice of pie! This would really showcase some of the larger prints and would make a really nice quilt! Pretty Petals. Thanks for the giveaway! That is an awesome design. I will definitely be back tomorrow to learn how to piece the curves. Hi Norma, I "checked out" your blog and you have lots of great things posted. Your pictures of the fair and your visit to Atlanta are fantastic. Your drunkard's path blocks are sensational as we have seen them suddenly appear these last few days in dots. I love your picture of the ferris wheel and with your esteemed background, maybe you could come up with a new block in it's honor. I checked out it's history on Wikipedia. I can think of so many things to do, but alas do not have the "skill set" or time to put them into practical use. From California, thanks for sharing. Very creative and I can see by all the dots around you that you are a dotty person. Dots seem to be something we can really have fun with. Great blog, super dots, bright show! blomstre is norwegian for flower..
Yummy collection of dots up there! Love the way you put the blocks together for the little quilty! What a lovely assortment of dots! Love the circles. Wind Spinner's Reminds me of the whirlygigs we had as kids and held out the car window so they would turn really fast or we would run run run to make them turn as fast as we could. I love your flower block! It is really cute. I have pieced curves before and didnt have any trouble but you have to pin the curve and start in the middle of the curve when pinning. Thanks for sharing. Beautiful project! You have an amazing dot collection...I am green with envy! I am scared of curves but am getting better over the years. What a wonderful display of fabrics... in every color! Love the cup and the baker?... yeah, I'd get it, too! I haven't made a DP yet but I do so love this arrangement! Will check back for your tutorial on putting them together. Your quilt reminds me of Bloomin' Spring. I love the way you used this pattern! I love the way this pattern showcases the different fabrics. Yep, I find curves to be vary scary. Like driving too fast around an" S Bend". Loved your Dr. Suess story start! You really should keep goin & finish! Waaaaay cool! :) LOVE your quilt block...and lay-out!!! So fun!! I love how your block turned into a flower - very neat! Polka Dot's Path is my suggestion. 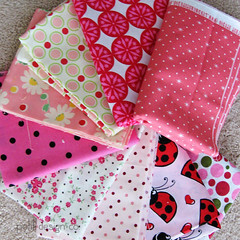 I love all your dottie fabrics. They're fun! The flower block is great and I look forward to the pattern being available. Thanks for sharing your work today! 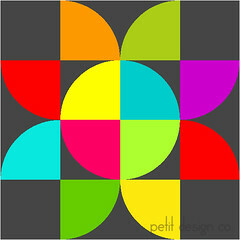 I like the circle flower! very nice dots. I loved the fabric in the dotted cup. Thanks. Cute blocks. How about a Quarty dots? 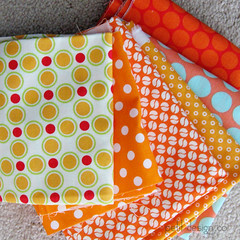 Love all your dotty fabrics and blocks. The quilt is great too! I haven't tried piecing curves yet. I'm just learning to quilt. I've tried curves, but I'm not going to go so far as to say I have mastered them. I need more practice, and I love the look of them so I know I will. Thanks for the giveaway! How about Flower Path as a name. I really like the quilt. 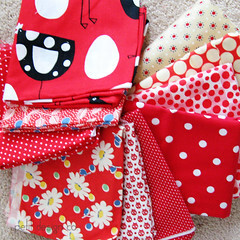 You have a great selection of dotty fabrics. Those chickens with dots are just too cute! I think I'll have to look for that fabric for my sister who, now that her boys are grown, refers to her laying hens as her "girls". I love that block!! I'll be back to check out about curves!! I would call it "Drunkard's Delight" because those flowers are delightful. Very fun! I've never tried piecing curves because it scares me a little. It's on my list to get to some day... Thanks for sharing! I love your block, I would love to make a quilt out of your pattern! Do you think it could be made out of charm squares? Your polka dot fabric collection is beautiful. Your quilt is so pretty. I love the way the quilt is laid out. Very nice! Wonderful dotty creations! The Drunkards Path is so cute! I'm not so good with names, but I'd suggest dotty bouquet? I've never sewn a curve, but I'd love to try! Goodness--that's one adorable stash-busting pattern! I'll have to check back later to see your curve-making post--fear is the only thing holding me back for curved piecing. 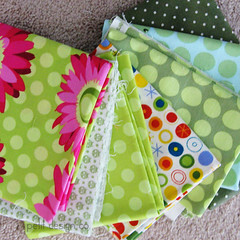 You really have the neatest and prettiest dottie stash!! Your Drunkard's Path blocks are great! I love you quilt blocks!! They will make a gorgeous quilt!!! Love, love, love this pattern and the colours are gorgeous!! Love your dotty blocks!!! Thanks for sharing and being a part of the hop! You obviously like polka dots, too. I love polka dots - always have. And I love your pattern - hint, hint! I think quilters love patterns and make quilts in their heads many times over from just looking at patterns. Thank you for participating and making this a success. I'm on creativity overload and in awe of each person who participated. Thank you! Absolutely love your quilt! and the block, of course. Love sewing with curves: ie Mariner's compass edge, etc. I do a lot of dresses with the curve/bustline/princess style also. It really is going slow enough to curve the material as you sew! Thanks for sharing. The pattern it looks like a sunflower to me. 'Sunflower Path' would be my suggestion. It's a great block! Love your blocks. Remind me of sunflowers withbthe large centers and curved petals. I enjoyed your tut. I''ve wanted to try drunkards path, but was a bit scared. You make it look easy. Thanks for sharing and the opportunity to win.